1. Clean the asparagus and trim any white ends or peel with a vegetable peeler. Cut the tip off each spear and reserve. Chop the rest of the spear into small pieces. 2. Melt the butter in a frying pan over a medium heat and fry the asparagus and bacon for 2 minutes, allow to cool slightly and remove with a slotted spoon. Add to the mashed potato and haddock. Add the egg yolks, mayonnaise, parsley, chives, seasoning and nutmeg and combine together. 3. Divide the mixture into 6, shaping it into patties with your hands. Dust each cake with flour, dip in beaten egg and roll in breadcrumbs, re-shaping if necessary. Refrigerate for 1 hour, 2 if possible. 4. Mix the mayonnaise ingredients and set aside. 5. Pour ½ inch of vegetable oil into a heavy based frying pan and place over a moderately high heat. When the oil is hot, add the fishcakes and cook for 4 minutes each side until golden brown, basting with oil to brown the sides. 6. Remove the fishcakes from the pan and place on a warm plate. Add the asparagus tips to the hot pan and fry for 1 minute. 7. 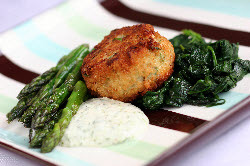 Serve the fishcakes with the pan fried asparagus, a little wilted spinach and the herby mayonnaise.